Taban, a nurse, is a young woman. We met Ms. Taban on a sunny summer day in 2008. We sat together beside a small stream in a valley. Along the stream, many tents were located, home for 120 displaced families. It was their fourth month in the camp. The distance between the camp and the nearest village was less than 1 hour, but they could not go home. During our visit, people came in and out her tent for treatment. A lot of people got diarrhea because of unclean water. Taban’s skills are very important in this cruel environment. Taban said after her graduation she made up her mind to come back to the village. In every country, always there are people who love the mountains and long to live close to them. Taban is such a person. 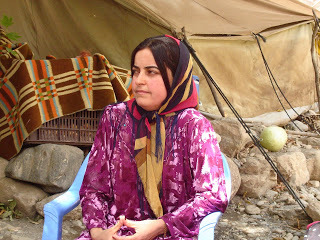 Ms. Taban has been displaced again since March of 2008, when the obligated protectors: the United States, the Iraqi government, and the Kurdistan Regional Government, renewed efforts to help Turkey and Iran use bombs and rockets to evacuate Taban from the border areas. In the last year and a half, we have witnessed Taban’s strength in dealing with the violence against her and her people. We watched fatigue stealing her beautiful face as she tried to be whole. But now her dream of going home to the mountains is fading away. How will we sit down and talk together about the important things: the blue sky, white streams, living nature and sustainable life?